In the Eurozone, manufacturing PMI reports last week were for the most part disappointing, as Italian manufacturing contraction unexpectedly accelerated (PMI < 50), while the French manufacturing sector has been in contraction mode for months now. With these poor manufacturing reports in the euro area, falling global commodity prices (see post), falling inflation expectations (see chart), and political uncertainty in Greece, German yields fell to new lows. 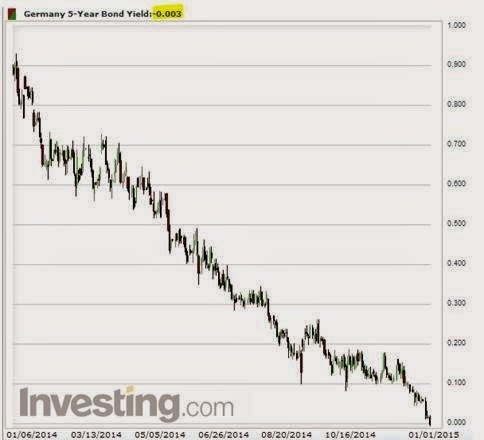 On the first trading day of 2015, the 5-year Bund yield went negative for the first time. 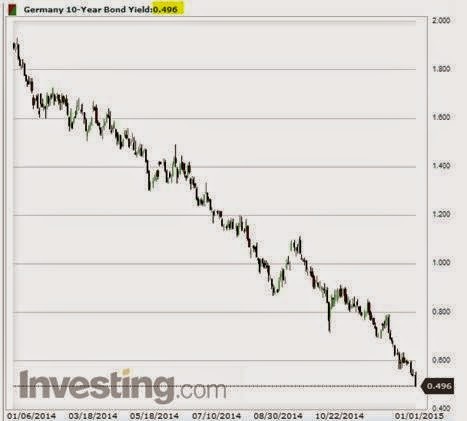 And the 10-year yield fell below 50bp – also for the first time. 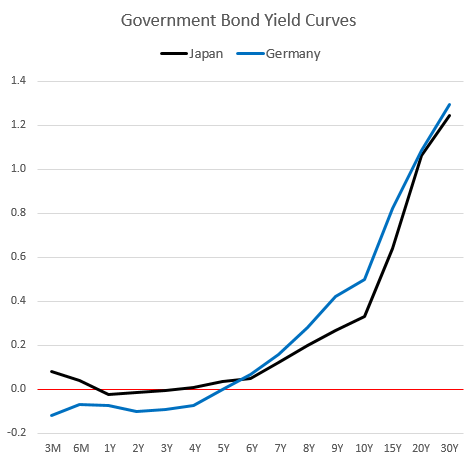 In fact, here is how the German yield curve now compares to that of Japan. The markets now expects the ECB's policy to shift closer to what has been implemented by the Bank of Japan. Italian and Spanish bonds also welcomed the new year with a rally, as yields hit new lows. While these falling rates have become a daily occurrence, these market levels are unprecedented. 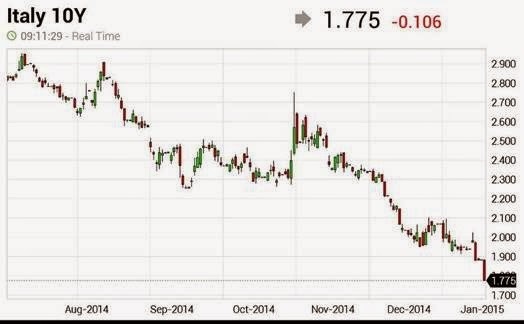 That's why as 2015 opened, the euro fell to the lowest level since 2010. The ECB is now under pressure to act - without a decisive bond-buying program over the next few months the euro area markets could face a sharp increase in volatility. That's something the area's nations can ill afford. The programs announced by the central bank thus far have been inadequate and a much more aggressive effort will be required to ease monetary conditions in the Eurozone. However, a number of prominent politicians, particularly in Germany, will be increasingly critical of such efforts by the central bank - especially as risks around Greece keep resurfacing. Reuters: - A senior member of Angela Merkel's party warned the European Central Bank not to pour money into Greece and other struggling euro zone states through bond purchases, saying this would reduce pressure on them to enact much-needed reforms. Michael Fuchs, deputy parliamentary floor leader of the German chancellor's Christian Democrats (CDU), told Deutschlandfunk radio on Friday: "We shouldn't pump extra money into these states, but rather make sure they continue along the reform path. "I'd be grateful if (ECB President Mario) Mr Draghi would make statements along these lines." 2015 is the year this conflict will come to a head as the ECB's reach, resolve and independence will be tested.